"Star Wars: Episode IX - The Rise of Skywalker" will premiere in theaters on Dec. 20. 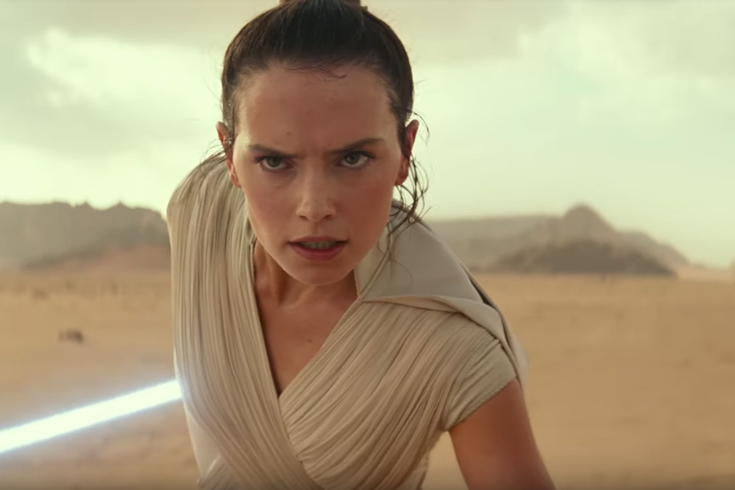 Disney debuted the first trailer for Episode IX, "Star Wars: The Rise of Skywalker," at a live panel for the Star Wars Celebration in Chicago on Friday. The trailer brings us glimpses of Kylo Ren, BB-8, the late Carrie Fisher, and even Lando Calrissian. As Fisher, starring as Princess Leia, as she holds onto an emotional Rey, Mark Hamill’s Skywalker voices over with “We’ll always be with you. No one’s ever really gone.” Apparently that's very true because at the end of the trailer we hear the evil cackle of Palpatine himself, back from the dead. The cast will feature returns by Daisy Ridley, Adam Driver, John Boyega, Oscar Isaac, Lupita Nyong’o, Domhnall Gleeson, Kelly Marie Tran, Billie Lourd, Joonas Suotamo, and, of course, Billy Dee Williams. Episode IX will mark the end of the Skywalker family saga. It also marks the end of the J.J. Abram directed trilogy released through Disney. Abrams brought us the first installment with "Star Wars: Episode VII - The Force Awakens" in 2015 with "Star Wars: Episode VIII - The Last Jedi" following after in 2017. (Spoilers) In "The Last Jedi" Luke Skywalker falls at the hand of his nephew, Kylo Ren. During a live discussion on Friday with Stephen Colbert, Ridley discussed what happened with Luke's light saber, which was handed down to him by his father, Anakin. "Well, my answer is not the end of the story... but the lightsaber that Rey inherited from Luke lives," she said. "Star Wars: The Rise of Skywalker" will open in theaters Dec. 20.